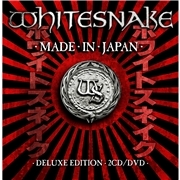 This disc is culled from a WHITESNAKE co-headlined festival in Japan, The Loud Park Festival. The festival gig was a part of the Forevermore World Tour. I must say that David and the boys know how to put everything to good use as the second disc is made up of sound check outtakes or acoustic versions. The boys in this case are guitarists Reb Beach and Doug Aldrich, bass player Michael Devin, keyboard guest Brian Ruedy and drummer Brian Tichy, the latter has since left the band. As always the ubiquitous David Coverdale is at the mike, as he has almost been ever since leaving DEEP PURPLE in 1976. The title of this disc must surely be a bit puzzling for his old mates. I have not been all that convinced about WHITESNAKE´s reason for being after “Slip of the Tongue”. Neither 1997´s “Restless Heart” nor “Good to Be Bad” from 2008 were to my liking. The first was weak, the latter seemed like David flying his own Zeppelin. But then came Forevermore” which I saw as a great sign of life. The tracks here are, to David´s plus account, not depending on former glories and different lineups. Instead the revamped WHITESNAKE dares to go for about 75% of their latter day material. I understand the necessity of including the most notable classics from the past but I also respect their decision to be what the band is now. I especially like the steamy bluesy atmosphere of this edition of WHITESNAKE, something that points to both the past, and a promising future. I dare say that old fans will also enjoy the likes of “Evil Ways”, “Best Years” and “Steal Your Heart Away”. We may never ever see David together with the legendary duo of Moody/Marsden, and there will never be a new Jon Lord (RIP). But I think that gone are the most awful solos of Doug (I remember once I Gothenburg with DIO…) and Reb has gone from WINGER light (a band that is also on the right track) to groovy blues and the necessary duels for this setting seem to come very naturally. I don´t think I´ll ever come to terms with, or even think about owning, “Good to Be Bad”, but that is not a major part of this. Nope, I have to say I appreciated this album far more than I ever imagined. Thumbs up!